Address: Khasra No. 1242 & 1243 Village Surajkund, Tehsil Phisagan Pushkar, Rajasthan India. This luxury resort in Pushkar is surrounded by the Aravalli Hills and set in a scenic valley, very close to the holy Pushkar Lake; The Westin Pushkar Resort & Spa is just minutes from many of the town's top attractions. Amid the natural beauty, The Westin Pushkar Resort & Spa ensures thoroughly relaxing experiences in modern facilities and luxury accommodation. The town of Pushkar ,Meaning "lotus flower" in Sanskrit, is rich in history ,heritage and culture . The tourists can engage in a walking tour around town to see the Brahma Temple. Built during the 14th century, it is one of the only temples in the world dedicated to Lord Brahma, according to the Hindu mythology, Lord Brahma created the universe. Another important temple is Savitri Temple—built in honour of Lord Brahma's wife .The spectacular lake and surrounding views are particularly majestic at sunset and sunrise. Approximately 16 Kms from Pushkar, Ajmer is another important Muslim pilgrimage centre and is highlighted by its most famous attraction, the Dargah Sharif. 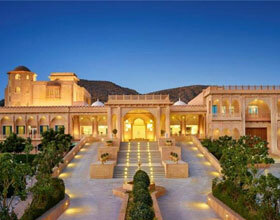 While at Pushkar , Enjoy the sunset camel safari through the sand dunes in the desert, . The 52 bathing ghats in Pushkar town around the lake offer spectacular views ,Pushkar hosts numerous colourful festivals and fairs throughout the year, The most popular being the annual Pushkar Camel Fair in November .The highlight of the 5 day fair is exciting horse and camel races, vibrant folk music, Rajasthani cultural dances and magic shows. The town, extremely popular both with Indian and the foreigners is filled with shops for textiles, jewellery, miniature paintings, and other Rajasthani handicrafts. The Westin Pushkar Resort & Spa is ideal location for events such as, business meetings, extravagant gala functions, weddings. The Westin Pushkar Resort & Spa, one of the top luxury hotels in Pushkar has a professional conference and banquet services teams who attend to every detail, from customizing the foods menus to detailing the entertainment options. The team is experienced with both traditional and unconventional weddings, receptions, as well as such post and pre wedding ceremonies as sangeet, mehandi and roka.